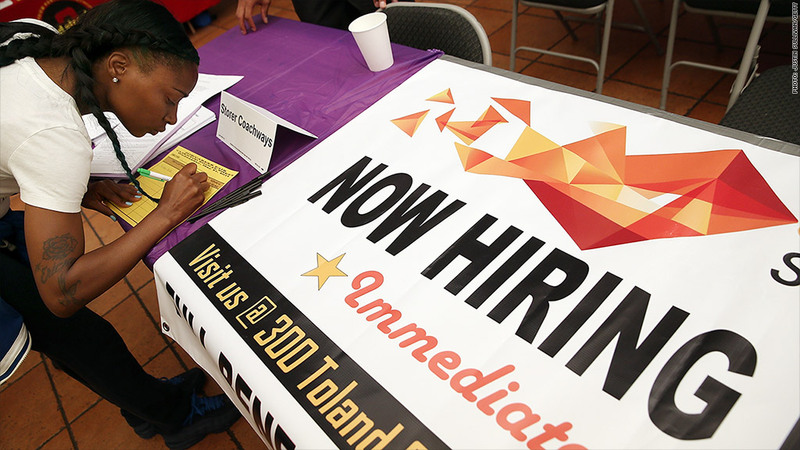 There's good news for Americans looking for work: job openings are on the rise. July marked the sixth consecutive month where there were more than 4 million openings, and there are signs that hiring is picking up too. There were 4.7 million total openings in July, a slight increase over June's figures, but almost 800,000 more openings compared to January, according to the Labor Department's Jobs Opening and Labor Turnover Survey (JOLTS). "We're in a self-sustaining jobs recovery." said Gus Faucher, senior economist at PNC Financial Services (PNC) in Pittsburgh. "Job growth is driving income growth, that in turn is driving consumer spending growth, and then that in turn is creating further job growth." In even better news for job seekers, employers increased their hiring in July, signaling 13 straight months of 4.5 million or more hires, the longest such stretch since the recession ended. There's also reason to believe that workers are feeling better about the opportunities that are out there. The quits rate, a measure of people who voluntarily left jobs but did not retire, stayed at 1.8% for the sixth month in a row, the Labor Department reported. That steadiness shows job seekers have confidence in leaving the jobs they already have, Faucher said. Federal Reserve Chairwoman Janet Yellen has been keeping a close eye on the America's labor market. She often mentions the JOLTS data during press conferences, adding weight to the report, which first published in 2000. Yellen cited information from JOLTS in her speech at the Federal Reserve's annual retreat in Jackson Hole, Wyoming, in August, where she stressed that the job market has yet to fully recover. "A significant increase in job openings over the past year suggests notable improvement in labor market conditions, but the hiring rate has only partially recovered from its decline during the recession," she said. The steady numbers of the JOLTS survey come on the heels of the Friday's big jobs report, which was below economists' expectations for jobs added in August. Although businesses are still cautious about hiring employees, Faucher predicts that August's numbers will be revised up and the job market will continue to gain momentum. "People are feeling more comfortable about the job market, " Faucher said.